This painting by Scrappers, called "Game Over 2," is a revisionist history of the Pac Man universe. 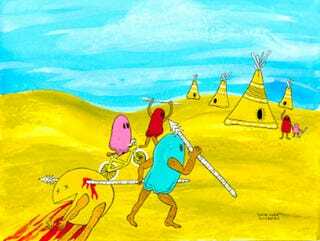 Here the native ghosts are triumphant over the colonizing chompy mouth oppressor. And there's more. These are just a few of the bizarre, haunting, and gooftastic paintings from Giant Robot Gallery's "Game Over Continue" Show, which opened on March 27 during the Game Developers Conference and closes today. So if you're in the San Francisco Bay Area, now's the time to check it out. I was there at the opening night, and the place was packed with indie gamer nerds, some showing off games they'd built just for the show and others just enjoying the videogame art ambiance. A frivolous but true observation: indie gamer nerds have incredibly good taste in hoodies. I would go to another opening like this just for the awesome hoodies, and then stay for the excellent art.